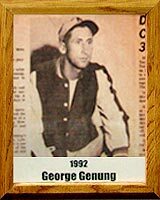 In the fall of 1940, young George F. Genung entered the University of Arizona, fresh from the graduating class of Tucson High School where he has been a member of two State baseball championship teams and was on the State first runner-up basketball team coached by Bud Doolen. George’s college studies were soon interrupted, however, by a call from Uncle Sam and it wasn’t until 1942 that he returned to the UA where he excelled in swimming, basketball, and baseball, including the assignments as Team Captain (baseball, 1943; basketball, 1943-44). In 1947, George began his remarkable career at Amphitheater High School. He was varsity basketball coach for an incredible 30 years; coached varsity baseball for six years; and was the school’s first football trainer (13 years). George spent a season coaching UA frosh baseball; coached the Tucson Police Dept. basketball and American Legion baseball teams; and was active in Little League. A member of the Arizona Basketball and Arizona Softball Halls of Fame, George received a tremendous number of awards and honors, one which are the words inscribed above the entrance to the gym at Amphi High School; George F. Genung Activity Center.